An English literature professor from Southern California by day and a world-class magician by night, Dale Salwak holds the distinction of being the only American invited to perform his act in North Korea. At SAIS recently, Salwak chronicled his experiences in Pyongyang in 2009 and this past April for the Grand Magic Show, the largest ever in the country’s history. His perspective on North Korea offered a look beyond stereotypes of a totalitarian system, mass famine, and nuclear proliferation, and focused instead on magic as a great leveler which emphasized entertainment value before political differences between two countries. –Magic, as a trade, is taken very seriously in North Korea. Similar in structure to the Chinese system, admission into its exclusive society is followed by a father-son bond of lifelong apprenticeship. Isolated from the West and having limited or no access to DVDs, books and the Internet, North Korean magicians have devised their own methods to magic that have long been known to performers like Salwak. A typical range of acts includes balancing telephones on handkerchiefs and life-sized dolls performing choreographed dance routines to traditional music. The local performers Salwak encountered on his trips cherished every new trick acquired and pleaded with him to share current “world trends” on magic. –The culmination of Kim Jong Il’s investment in the arts took place this past April at the Grand Magic Show, a tribute to the late Kim Il Sung. Like his father, Kim Jong Il appears to hold a great interest in magic and the circus, dating back to the country’s early history of Soviet influence. In a place where high-tech entertainment is hard to come by, the Grand Magic Show dazzled a crowd of 150,000 at May Day Stadium, which is the site of the Arirang Games, an annual two-month-long gymnastics festival also in honor of Kim Il Sung. As a spectator at the Grand Magic Show, Salwak watched as the country’s most famous magician, Kim Chol, appeared in a cloud of smoke and fireworks, forcing a bus full of giddy local residents to levitate several feet above the ground, and later, make a horse, an elephant and a helicopter materialize out of thin air. What would have otherwise invoked a roaring response from a typical American audience, the crowd respectfully cheered with subdued, tepid applause. Amid a burst of fireworks and a haze of smoke, a burly showman in a white sequined suit and gold lame cape appears with a flourish. Over the next 45 minutes, he appears to make a Pyongyang bus levitate and wriggles free from a box sent crashing to the stage through a ring of fire. This is magic North Korean-style performed in a show touted as the country’s biggest ever and mounted in a city where good, old-fashioned illusion, a dancing bear and a dose of slapstick comedy can still command the biggest crowds of the year. The country’s love for magic is a legacy of the circus traditions they inherited decades ago, during an era of Soviet influence. North Korean founder Kim Il Sung ordered the creation of the Pyongyang Circus in 1952 in the middle of the Korean War. The tradition of highly technical stagecraft — including the Arirang mass games, where 100,000 performers move in sync in a feat that has come to embody North Korean discipline and regimentation — still dazzles in a country where high-tech entertainment is scarce. In fact, North Koreans so love magic that two diplomats dispatched to the United Nations had a special request in 1995 of their American hosts: They wanted to go to Las Vegas to see David Copperfield. Wowed by the world-famous illusionist, the diplomats were determined to bring Copperfield to Pyongyang. But politics and finances trumped entertainment, and plans to bring the American magician to a nation still technically at war with the United States vanished in the haze of diplomatic tensions. Undeterred, North Korea has kept putting on shows of its own, and it unveiled a massive one Monday at the capital’s May Day Stadium. It was designed by Kim Chol, dubbed the “David Copperfield of North Korea,” and will include seven performances in all. The show stars Ri Thai Gum, a beefy showman with the extravagant flair — and physique — of a pro wrestler and the skills of Houdini. He whips off his white suit with silver-sequinned lapels to reveal a tank top and then straps on a gold-appliqued cummerbund onto his hefty waist. The event was a highlight in a week of festivities surrounding Kim Il Sung’s April 15 birthday. Many of the women turned out in festive traditional Korean dresses reserved for special occasions, sparkles sprinkled into their hair and wearing fur-lined vests to keep warm in the spring chill. Outside, pink and yellow lights illuminated a fountain as music played to crowds enjoying an evening out. And it does, adding in a healthy dose of slapstick comedy. The tricks are simple crowd pleasers: A Pyongyang city bus filled with waving passengers appears to levitate and then disappear; an acrobat seems to float through a magical skyscape of clouds. There’s the classic magician’s assistant dressed in traditional Korean dress who gets into a box and reappears halfway across the stadium. The highlight involves a helicopter and a ring of fire that aim to have the clapping audience, mostly Koreans and a smattering of tourists and foreign dancers and musicians visiting the city for an arts festival, on edge. Current leader Kim Jong Il is said to have inherited his father’s love of the circus and is thought to be the one to push to bring Copperfield to North Korea. Copperfield’s stage manager once called North Korea’s staging technology “among the most sophisticated in the world,” according to Namkung. Namkung, who took the North Korean diplomats to Vegas and later brought a Copperfield delegation to Pyongyang to discuss a visit, recalled that the time was ripe to bring a big American star to the North Korean capital. The U.S. and North Korea had just signed an agreement for Pyongyang to freeze its nuclear power plants and to replace them with light water reactors less prone to weapons proliferation as part of a plan to normalize relations between the longtime enemies. There were high hopes that Copperfield’s show — to be broadcast live on state TV in North Korea — could pave the way for a new era in relations between the bitter wartime foes. And in a symbolic show of support for reunification, Copperfield agreed to travel through the Demilitarized Zone dividing the two Koreas and perform for the South Koreans as well. “This was right after the ‘agreed framework’ signing at a time when it looked as if the two nations would go down an entirely new path, and the atmosphere in Pyongyang was giddy,” said Namkung, who also serves as a consultant to The Associated Press. Copperfield himself was game, promising to make the city’s iconic Juche Tower disappear, just as he did the Great Wall of China and the Statue of Liberty. So seriously did the North Koreans take Copperfield’s visit that they staged a private viewing of the circus for his production team’s visit to Pyongyang and promised to give the illusionist a vast suite once used by former President Jimmy Carter on his visit in 1994, Namkung recalled. But the State Department thought it was too early to back the venture, and the plan eventually foundered over how to finance the trip. The AP was not allowed shoot video of the performance, but here is the AP’s video coverage of the event. A large-scale magic performance will take place in Pyongyang, the capital of the Democratic People’s Republic of Korea. The program will include appearance and disappearance of aircraft, large bus with full passengers and big animals like elephant, as well as a motorcyclist’s fantastic skill and the magician’s floating in the air as if in a gravity-free space. The aircraft, large bus and elephants are all real ones. The spectators will enjoy a new form of magic show with several numbers connected with each other. The performer is Kim Chol (50), a vice-chairman of the Magicians Association of Korea and head of the magic creation group of the Pyongyang Circus. His father Kim Thaek Song and his younger brother Kim Kwang Chol are also talented magician. He became an eye-catcher already in his teens, drawing the limelight of the magic circles. He began to distinguish himself with his marked individuality at international magic festivals from the 1980s. His masterpieces are “Girls Reflected in a Mirror” and “A Rich Catch of Catfish”. Magic pieces of the DPRK won more than 20 top prizes at international magic festivals.. Founded in Juche 41 (1952), the Pyongyang Circus has produced 1,200 acrobatic works, winning more than 70 awards including 36 gold prizes at 38 international circus festivals. The circus has performed on 35,000 occasions in total at home and abroad, including 250 tours around the globe, earning international prestige. The premiere of the magic show will be given on April 18, a day of the 27th April Spring Friendship Art Festival. The performance will be staged about six times, twice a week. Many local and foreign people have booked tickets for the spectacle. According to the KCNA, the performance will include the appearance and disappearance of an airplane, bus and elephant, and a magician floating in a weightless state. Kim Chol, the performer, is a magician with the Pyongyang Circus, according to the report. It would premiere on April 18 at the stadium, which was also the venue for the grand gymnastic and artistic performance “Arirang,” the report said. There would be six performances in total, given twice a week. This is an all new event that is taking place for the first time this year between April 18th and May 9th in the massive May Day Stadium in Pyongyang. The exact nature of the event is thus-far unclear so we cannot confirm or deny that any actual ‘magic’ will take place but suffice to say it will be an event on a very large scale comparable to the Arirang Mass Games (running this year from Aug 1st – Sept 10th). We Will be able to take anyone who visits DPRK during this time to the event which is running every Wednesday and Saturday night. This should be something not to miss and anyone who goes will be seeing one of North Korea’s trademark spectacular events for the first time, something to make all your friends jealous! Our full tour list is online here and any tour during that date will get you to the Grand Magic Festival! No tax on the March tour! Our March Madness tour this year is closing fast but we still have time and space to add more people to this economically priced but amazing trip. The full details are online here and we’re accepting applications until the end of this month. 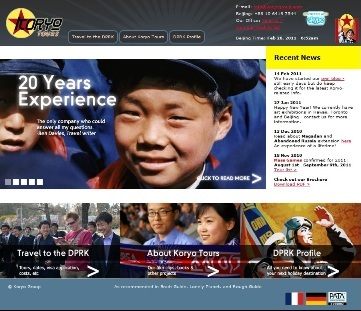 The chance to be in North Korea on the anniversary of tax abolition is priceless indeed! For the second year running Koryo Tours is proud to run this utterly unique tour, something available only through us and we would love you to come along and join us on this amazing trip that goes from North East China into the obscure and little-known North Korean free trade zone of Rason, then to become only the second ever tour group (our group last year being the first) to cross into Russia by train, we enjoy sometime at and around a local beach there before heading to Vladivostok, the main city of far-eastern Russia to see what this previously-closed city is all about. The full details for this tour are online here. Please ask us any questions about this tour, if you ever wanted to do anything completely unique then this is your chance. It’s an amazing trip and something truly memorable! Although I have never traveled with Koryo Tours to the DPRK, I have traveled with them to Turkmenistan and that was an amazing trip. Also, “Magic” seems to be popular in the DPRK. A quick search through YouTube finds lots of North Korean magic shows. I even posted a North Korean magic show that aired on TV earlier this year. You can see it all on YouTube starting here. You are currently browsing the archives for the Magicians Association of Korea category.